Big news! 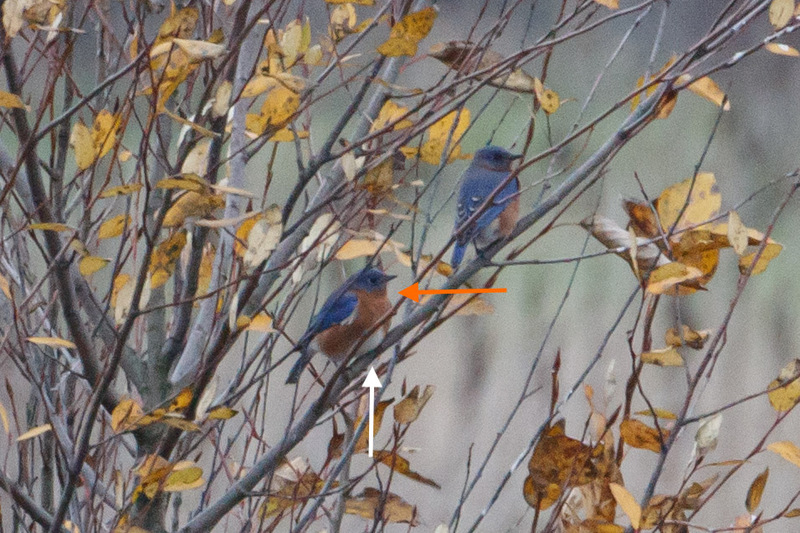 My friend Eric Carlson found a pair of Eastern Bluebirds in Oregon! Amazingly this is the first state record!! None have been recorded on the entire west coast. There isn’t yet a record in California or Washington. 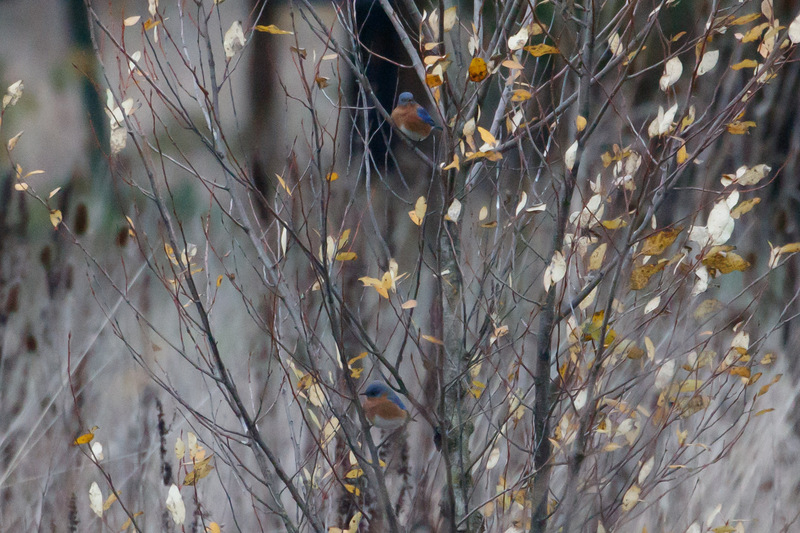 It’s made every Oregon birder review their Western Bluebird photos and rethink their past sightings. The differences between Eastern and Western Bluebirds are subtle especially if you’re not expecting them. 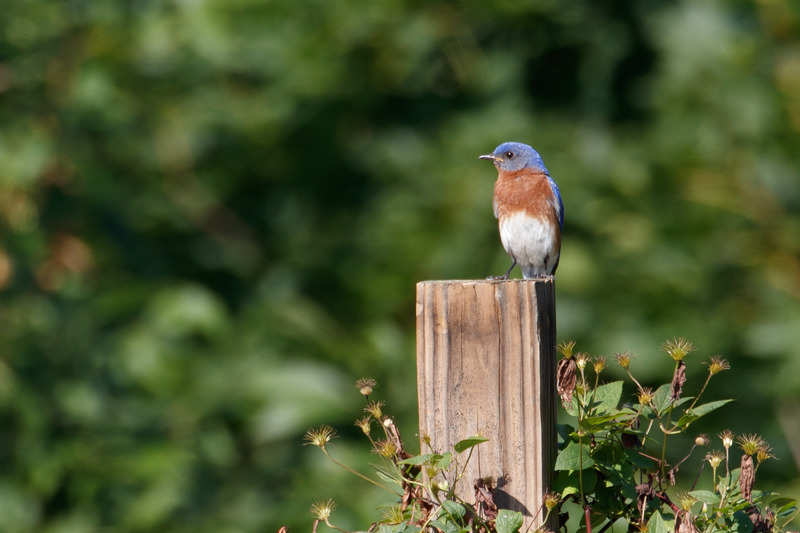 When Eric saw the birds outside the Dharma Zen Rain Garden, he posted them on iNaturalist as Western Bluebirds. During iNaturalist’s community review process 21 year old birder Joshua Smith of Fort Collins, CO chimed in that he thought they were eastern. Then the whole thing “blue” up. Luckily they’ve stuck around so everyone can enjoy them. I went early on a rainy morning where I met many other birders. It was like a fun reunion. 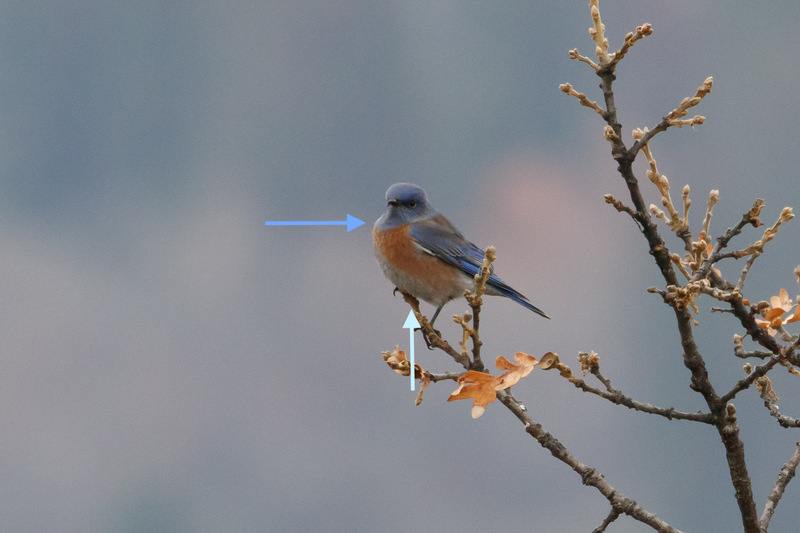 Eastern bluebirds have a bright white belly, and orange color that comes up to the throat and sides of the neck. Adult Western Bluebirds have a blue throat and a bluish belly. It’s been determined that both of Eric’s birds are males because of their bright blue color. Pretty incredible to have two birds as the first state record and two males at that! This spot is where Eric has found Say’s Phoebe, Western Bluebirds (and now eastern), and an Eastern Kingbird. I last visited in March not long after my surgery while I was still on crutches and a knee scooter. It’s a great piece of habitat and I hope it’s kept preserved as a grassland space. It’s also in my 5MR! 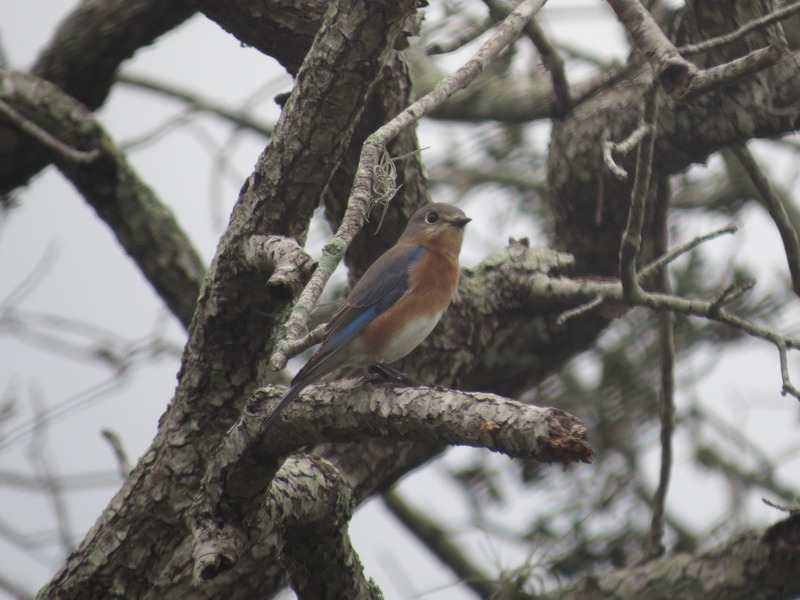 Eastern Bluebird is not life bird for me since I’ve seen them in Florida while visiting family. And this summer while visiting Tomas’s family in Michigan. But Eric’s birds are my Oregon state year bird #307! And a great reminder that sometimes you don’t have to go far to find something special. Next year I’m going to focus more on local patches and spend more time birding and less time driving. Such a fun sighting and I’m so happy for Eric!!! Congratulations! After every trip to sea I feel like I come back a different person. After a few successful trips, I think I’ve gained some insight that might help pelagic-curious people out there. Or those who’ve had bad experiences (like I have). If you’ve never taken a pelagic, I’d recommend starting with a shorter trip. I started with 12 hours and probably shouldn’t have done that. Get to know what it’s like because it is a strange, smelly, unsteady, and awesome (!) world out there. Who knows, maybe you’re one of those lucky people with a steel stomach. Unfortunately, that’s not me. Everyone has their own comfort levels and know what works for them, but here’s a breakdown of what works for me. TLDR: take Bonine over-the counter medication for motion sickness the night before, and the morning of the trip and you should be good to go! I wear five layers on top. A tank top undershirt, followed by a long sleeve Smartwool base-layer, a Columbia fleece vest (that has bonus pockets), a poly sweatshirt on top and then rain jacket over everything. I keep a backup puffy jacket in my pack too just in case (I only had to use once on a really chilly trip). My Red Ledge rain jacket has amazing pockets large enough to hold a 16.9 oz bottle of ginger ale. This is the key to taking fewer rocky trips to the cabin. My rain pants were too tight on my first trip and the pressure from the elastic band exacerbated my stomach pains. So I’ve since made a bunch of trips to Andy and Bax surplus sporting goods store to try out pants. I ended up swapping out traditional rain pants in favor of Viking brand Journeyman Waterproof Industrial Bib Pant. I unsnapped the bib and cut off the suspender part. They are comfy and I love them. Underneath I wear Smartwool mid-weight base layer pants, with some gym shorts on top. I wear two pairs of socks, one light and one thick for warmth and cushion since most rain boots aren’t very insulated. I should probably invest in another pair of Bogs, but for now I bought a cheap (but solid) $12 pair of rubber boots from Fred Meyer. They get the job done for now. My gloves are fingerless flip-mittens made out of alpaca wool and acrylic from Andes Gifts (found at New Seasons). And my favorite sun hat is Columbia Coolhead Cachalot Hat (not just for men! ), the safari flap tucks under nicely and the adjustable drawcord in the back tightens securely for windy times. I’ve found an amazing retailer for waterproof camera covers in the UK called Camera Accessories Outdoors. Their products are well-made and reasonably priced. The one for my camera/lens combo is under $30 including shipping. I use another camera lens sleeve underneath for double protection, but it’s pretty much just a plastic bag. The more covers the better since sea salt can do a lot of damage to equipment. (I clean my gear after each trip). My pelagic planning begins the week before. I cut out coffee and alcohol, eat bland food, and get plenty of sleep. Sounds extreme perhaps, but the more cards I can stack on the side of a good outcome the better. I’m in favor of medication (talk to your doctor). I wasn’t anxious my first trip and then I got seasick. Now my body tries to protect me from doing that again. Thanks body, but I love albatross too much. So now I have anti-anxiety meds (Lorazepam) just for boat rides (similar to situational anxiety for flying). It’s really helped, because this is not the appropriate time for a fight or flight response. Someone recently asked if weed would have a similar affect, and maybe? It is legal here. But I’ve never had a good reaction and wouldn’t want to add another element of uncertainty for myself. My thoughts on Scopolamine: also called “the patch” or Transderm Scop, which is a small round band-aid sized prescription for motion sickness that goes behind the ear. I tried it my first trip and got sick. What I didn’t know (and the pharmacist didn’t tell me) is that it should be put on the night before a trip, so maybe I would have been fine, but it’s dead to me now. Some people, even guides use it and swear by it. Others have had adverse side effects (blurred vision) for days. I’ve had good results with over-the-counter Bonine so I’m sticking with that. The night before: Some people can drink beer and eat hotdogs the night before. I could too, but then I’d get sick. To avoid this I eat bland food. I had a basic BLT sandwich one time (dry), and before this last trip I ate a bowl of Honey Nut Cheerios because it was easy. I have one half (to one) anti-anxiety pill and a Bonine pill for dessert. Yum. The morning of: Wake up, get base layers on, go to the bathroom 100 times (approx.). Eat something. I had half a plain bagel and half a banana last trip. Some people can handle coffee, I can’t (I’d never leave the bathroom). I take the other half anti-anxiety pill, Imodium A-D, Bonine, and this time I took two Ibuprofen to ease my mind about potential ankle pain. Somehow I get the rest of my gear on and get out the door. On the boat: Anxiety is better (hopefully medication is working). There are birds to look at! Wonderful distractions. During slow periods mental strategies help: think about the turnaround point, look at the horizon, stay out of the cabin and try to get fresh air (beware of diesel and chum stank). As hard as it is, it helps to snack. I munch on saltines, have a Lifesaver, or some nuts. I tried almonds last time but they were too big and turned into gummy paste in my mouth. I had better luck this time with shelled pistachios. Salt is good. Some people can have ginger candy, ginger snaps, etc. I can’t stomach the power of ginger so I’ve found pineapple flavored Lifesavers to be a good mild alternative. And if you have to get sick, you’re not alone, it happens. And time to plan the next trip. Every time is different, there’s highs and lows, but the birds always make it worthwhile. And having a system in place can help ease the struggle. 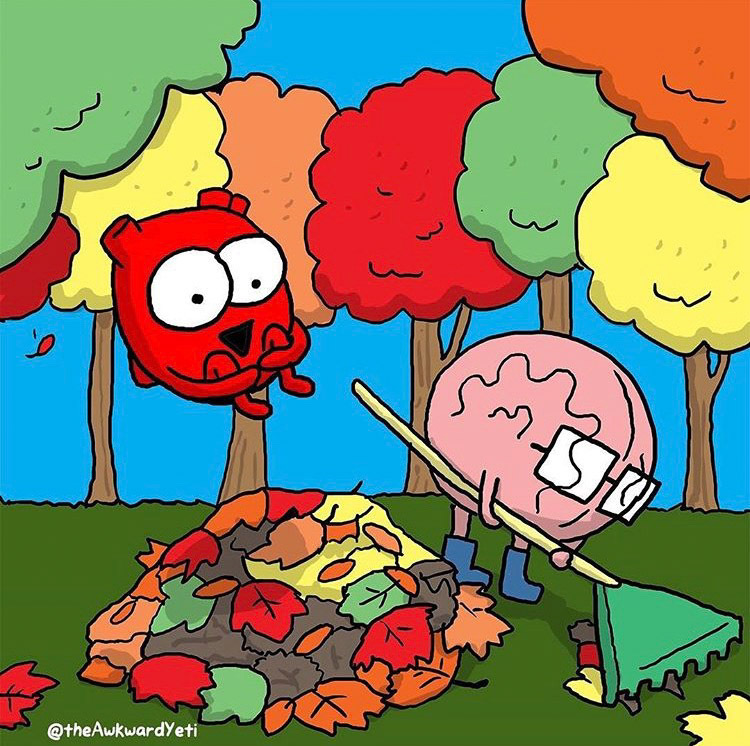 My brain wants to protect me from the trauma of my first trip, while my heart wants to keep trying. First, a big THANK YOU to my donators! 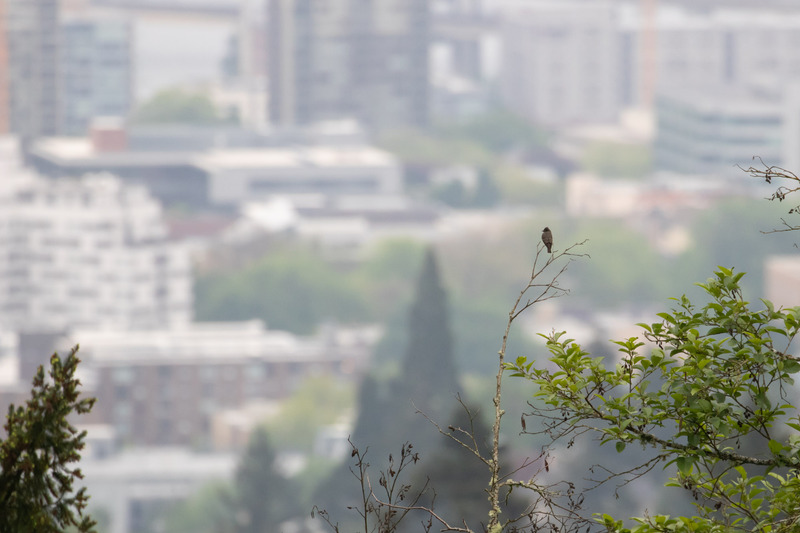 I couldn’t raise money for the Audubon Society of Portland without you. This year I joined two teams, The Murre the Merrier and Brewery Blackbirds. The Murre the Merrier, led by Sarah Swanson and Max Smith was a 12-hour day, starting from the Pittock Mansion in Portland, continuing at the coast in the afternoon, and ending back at Dawson Creek in Hillsboro. Birdathons are intense! We try to see as many species possible in a day and this time was no different. 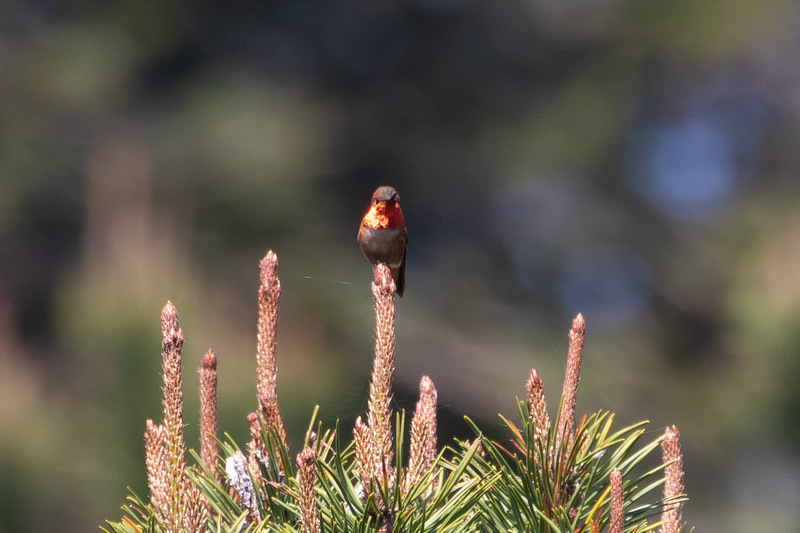 Some of the highlights included Purple Finch, Western Tanager, Wilson’s Warbler, and a FOY Western Wood-Pewee at Pittock Mansion. We stopped at Smith Homestead in the Tillamook Forest along Hwy 6 for Hermit Warbler, American Dipper, excellent sounds of Evening Grosbeak, and even better looks at perched Violet-green Swallows. At the coast we visited Sitka Sedge State Natural Area, Oregon’s newest state park, that has an excellent trail through a saltwater marsh. We found Marsh Wren, Spotted Sandpiper, and two Black-bellied Plovers decked out in breeding plumage. We missed a normally reliable Wrentit, and instead got lovely looks at a Rufous Hummingbird that flashed us his golden gorget. 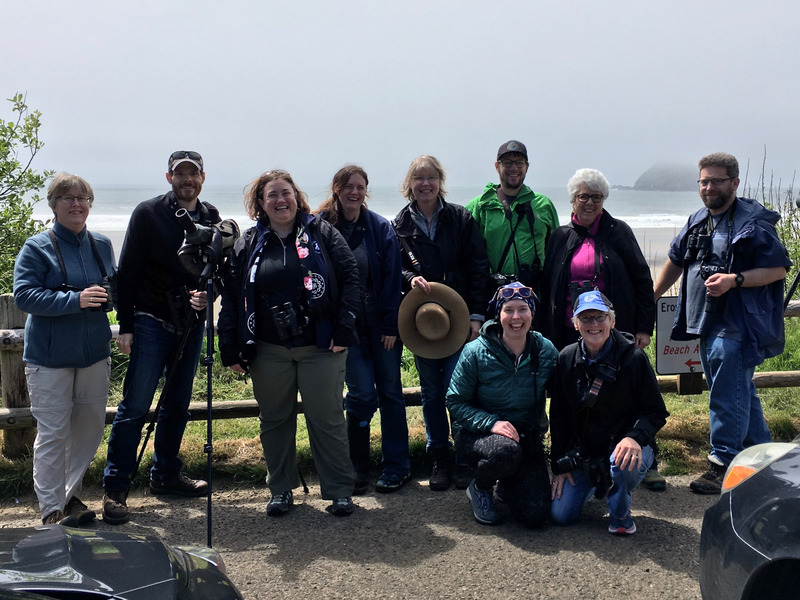 We stopped for lunch at Sarah’s family beach house in Pacific City as we scoped Tufted Puffins on Cape Kiwanda’s Haystack Rock and watched a flock of Greater White-fronted Geese fly by. 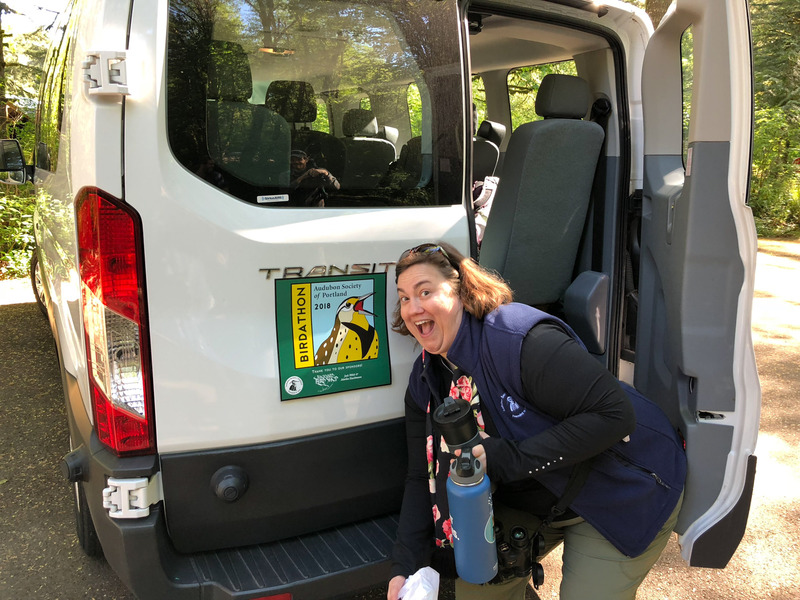 We picked up a few other coastal species including Pigeon Guillemot and we made a special stop to add Common Murre (The Murre the Merrier!). While scoping birds a woman asked us what we were doing, and she was rewarded by having to take our group photo. So nice of her. Back inland, after seeing no woodpeckers all day it was decided we’d end at Dawson Creek where Acorn Woodpeckers were a sure bet. And they were, along with Wood Duck, Yellow Warbler, Bewick’s Wren, and a FOY Olive-sided Flycatcher that brought our total species count for the day to 101! Great job team! 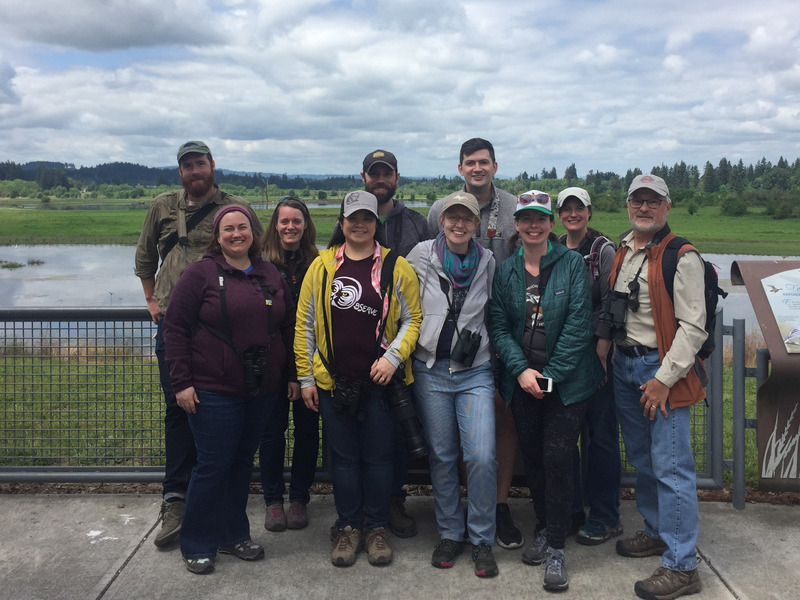 Saturday’s Brewery Blackbird Birdathon trip, led by Colleen McDaniel, was spent at Tualatin River National Wildlife Refuge. This was a great day. 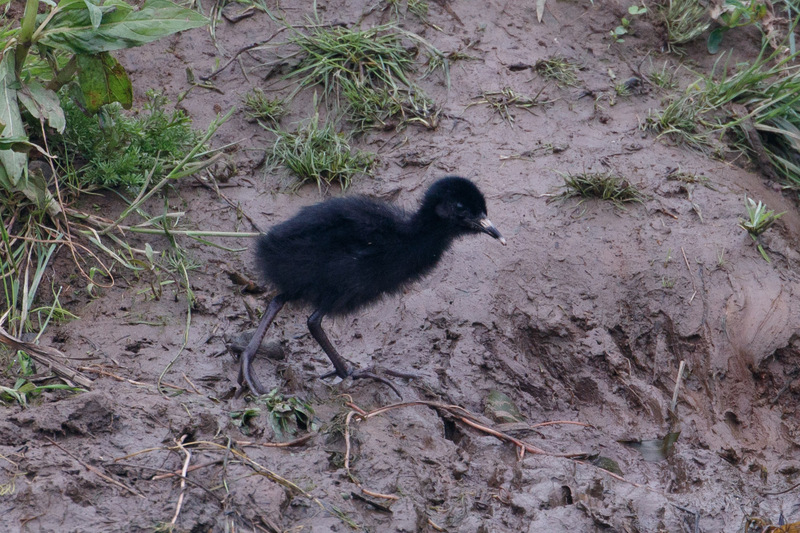 The park promised baby Virginia Rails and it actually delivered! Soak it in. Because it’ll never be seen out in the open again. 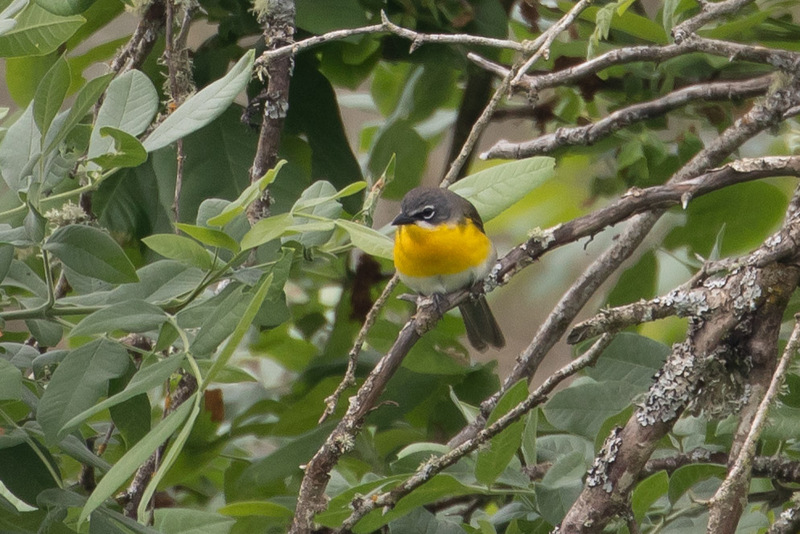 Other highlights included Lazuli Bunting, Black-headed Grosbeak, a singing Swainson’s Thrush, Willow Flycatcher, and the most cooperative Yellow-breasted Chat. We saw Blue-winged Teal, Cinnamon Teal, and Green-winged Teal (teal slam! 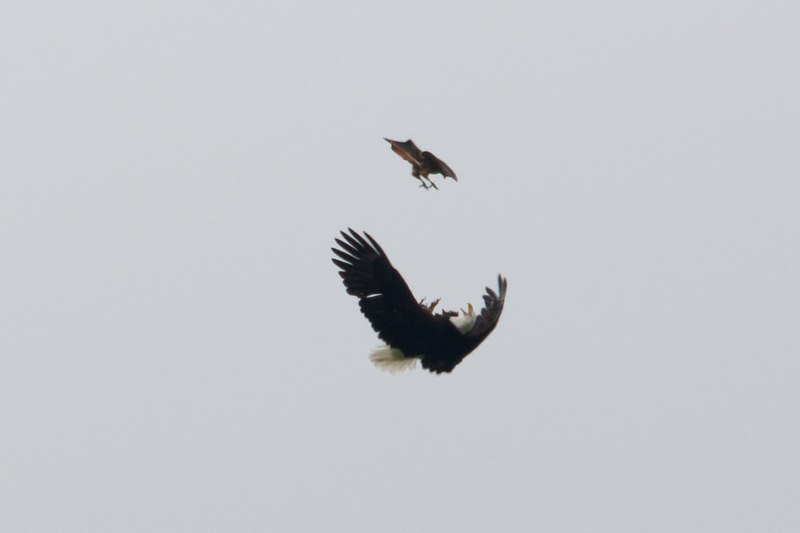 ), and a Bald Eagle defy gravity while battling a Red-tailed Hawk. Quite the display. Along the forest trail, Sarah spotted a Great Horned Owl surprisingly perched on an open maple branch. 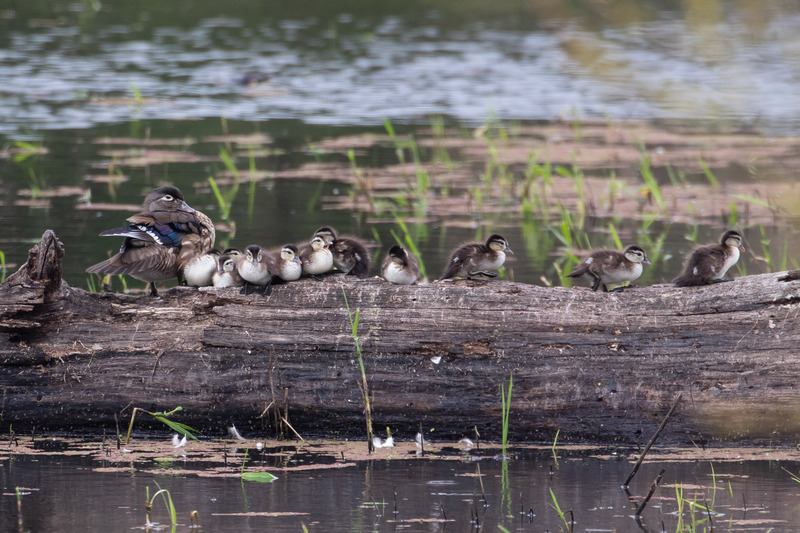 And another highlight was this Wood Duck family on a log. After four hours we ended with 74 species. But because we’re good birders, we added a House Finch outside Stickman Brewery after pizza and beer bringing our total to 75. 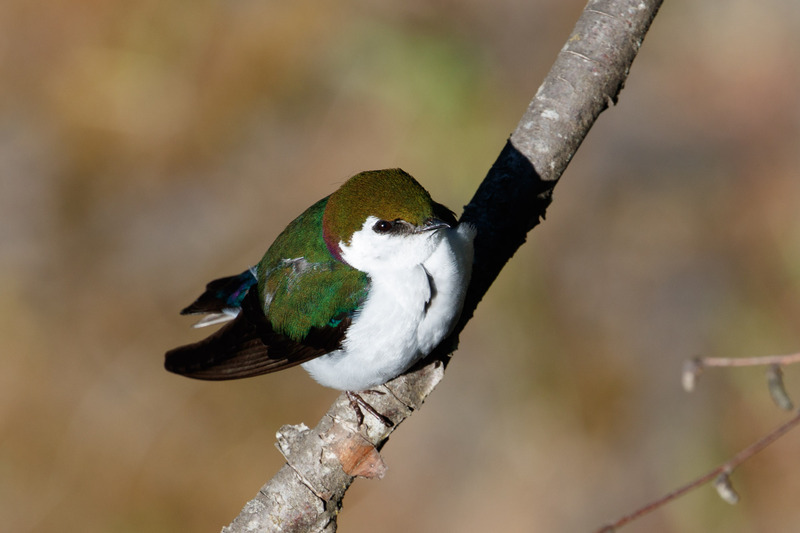 Is May the best month for birding? It sure feels like it. So many great birds seen with great people! All for a great cause.